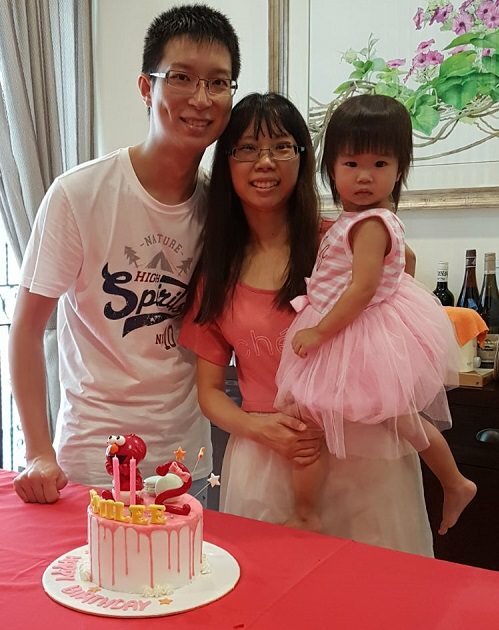 Emilee turned two yesterday and had a cosy little celebration with the family. I would love to throw a party for her with all the frills and bang but just not now. Maybe in two to three year’s time when she decides that she wants one. Even her preschool doesn’t encourage parties and goodie bags so that the kids from lower income families don’t feel pressured to outdo one another. 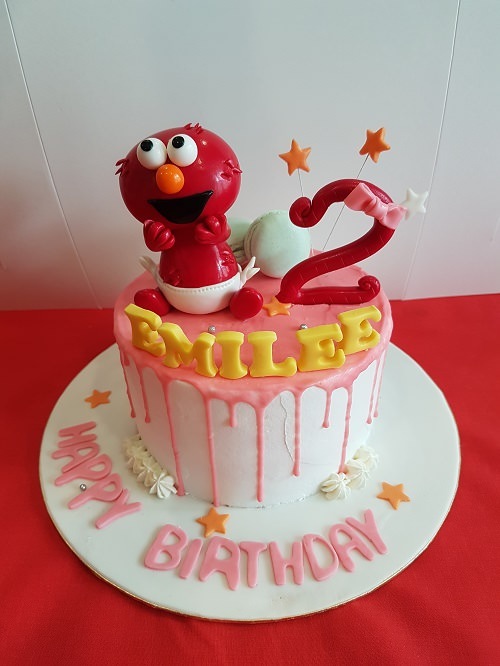 However, I decided that she deserved a nice birthday cake as she’s at the age where she can recognise cartoon characters and she has her favourite — Elmo. The family isn’t big on sweet foods especially with my mum (and possibly me) being diabetics. I initially planned to get a chiffon cake with customised cut-out characters from a fairly famous home baker but she was out of slots. So began the little scramble for suitable home bakers. If you’re working in a government agency, you’ll be familiar with the three quotations guideline. That was what I did. I finally settled on Dough Remi as they were having a promotion on cakes and the cost ended up being the cheapest. I admit I have no knowledge in ordering customised cakes so cost was the main factor for me. The end product was fantastic considering the process of negotiating the design. After those horror stories shared on social media about home bakers and cakes gone wrong, I was really afraid what Emilee’s cake would turn out to be as there was no confirmation drawing of what the final product would be. I only hoped that my description was clear enough. A closer look of the customised Elmo cake. Based on just three pictures and my description, I would say this is fantastic! My criteria was a drip cake with a white base and pink drip. It had to have a 3D Elmo and number 2 sitting on top, and the stars shooting out from behind. I also mentioned to include Emilee’s name. I was impressed that the baker added two macarons and the Happy Birthday wording in front. The 3D Elmo was actually quite heavy. I’m quite happy that the baker took extra care with that and embedded a thick bubble tea straw to support the stick and weight of the character. The number 2 was starting to tilt after a while being out in room temperature. I suppose it was because the fondant couldn’t take the heat. I quickly popped it into the fridge to harden it and managed to push it straight up without any damage. I was a little puzzled by the piped white stars at the bottom. Was wondering if they were there to hide some flaws as they weren’t piped all round, but they weren’t too glaring against the overall design. I wish I had taken more pictures to support my review but I guess you’ll have to take my word for it. The cake was put in a regular white cardboard cake box with the sides stapled so the flap would be up to support the full height of the cake. The whole box was carefully cling wrapped. I was given a list of cake flavours to choose from and went with strawberry shortcake as it seemed to go well with the colour scheme. It was also recommended by the person I was communicating with. Strawberries are Emilee’s favourite too. The cake was not too moist or too dry. It wasn’t too sweet too which was a huge relief. Overall, the cake was quite normal. I’ve eaten some really horrible tasting cakes before so when I say it is normal, it is good enough. More importantly, Emilee liked the cake. Not taking into consideration the discount I got, the cost of the cake is comparable to other home bakers’. I felt it was reasonable enough for the level of customisation and skill required. Communication was clear. Thank goodness there were no hiccups. Right up to the night before the collection, the mummy did confirm the time I was picking up the cake. I’m sure she would give the same level of professionalism to any other customer. I chose to collect the cake to skip out on the delivery fees. (Yes, I am cheapskate like that. Lol.) Well, it was either collection at Woodlands or Seng Kang. Of course I went with the latter as it is nearer to where I stay. Dough Remi does dessert tables as well. They have provided for normal customers, as well as corporate customers like Pampers and Nestle. For more pictures of their creations, do check out their website and Instagram.